I was a Teenage Gila Monster!It may seem like any other dynamic concert for The Amazing Joy Buzzards, but a menacing pink robot with a thirst for revenge has managed to sneak backstage and slip something sinister into the drink of Stevo, the bass player. Once consumed, the nefarious concoction mutates Stevo into a giant Gila Monster! The mutated Gila-Stevo runs amok through the city in an epic rampage the likes of which not seen since Godzilla. The remaining members of the band must find a way to locate and rescue their giant-sized bandmate before its too late! What are the intentions of the evil pink robot and why does he want The Amazing Joy Buzzards dead? Will our gang make it to Stevo before he meets a King Kong-esque fate? 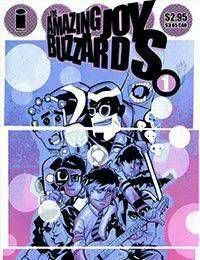 Dont miss the first smackdown issue of THE AMAZING JOY BUZZARDS!